The Rickard thermo-disc ceiling diffuser is a mechanically controlled, thermally powered VAV diffuser. It requires no external temperature sensors such as a wall thermostat as each diffuser contains its own in-built temperature sensing and volume control mechanism. Its overall appearance and construction is very similar to the electronically controlled diffusers, but has the advantage that it requires no external wiring or power supply. 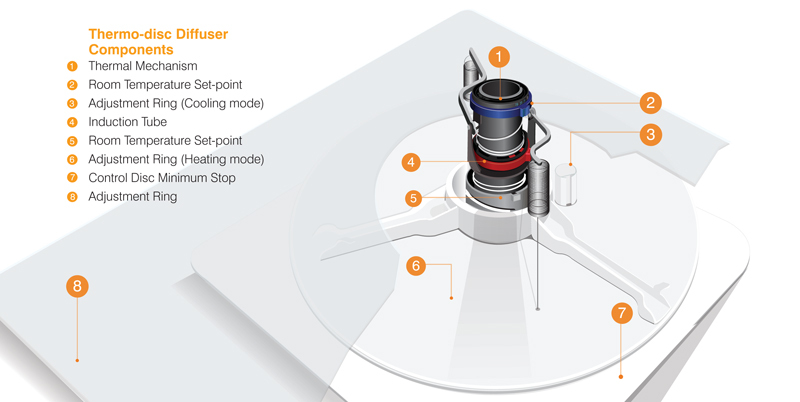 As with the electronic version, air volume control is achieved through the vertical up and down movement of the control disc within the diffuser. In the case of the thermo-disc diffuser, this movement is caused by the expansion and contraction of the diffuser’s mechanism at set temperatures. This increases or decreases the aperture size which allows either more or less conditioned air to enter the space and effectively maintain a constant air movement from 100% down to 25% of maximum air volume. Setting and adjusting the room temperature set point is easily achieved by rotating the adjustment rings; blue ring for cooling and red ring for heating. The rings have calibrated temperature markings from 19°C to 24°C to suit individual occupant choice. To access these rings when installed, occupants simply rotate the diffuser trim-plate counter-clockwise and remove it from the diffuser back pan. * The Rickard design examples shown below illustrate the thermo-disc system. When aperture size increases, more conditioned air is allowed to enter the space.